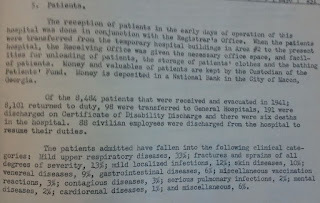 Camp Hospitals kept records. 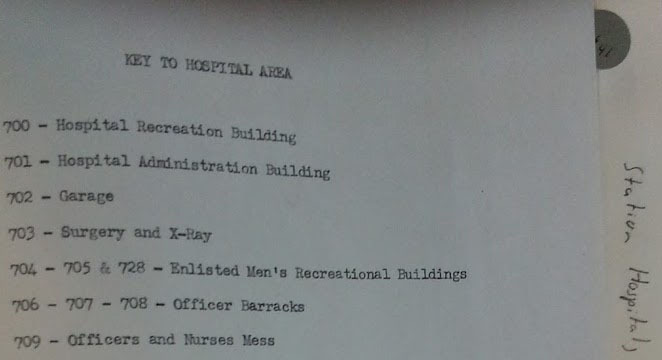 The Adjutant General kept reports and the Surgeon General’s Office was kept abreast. 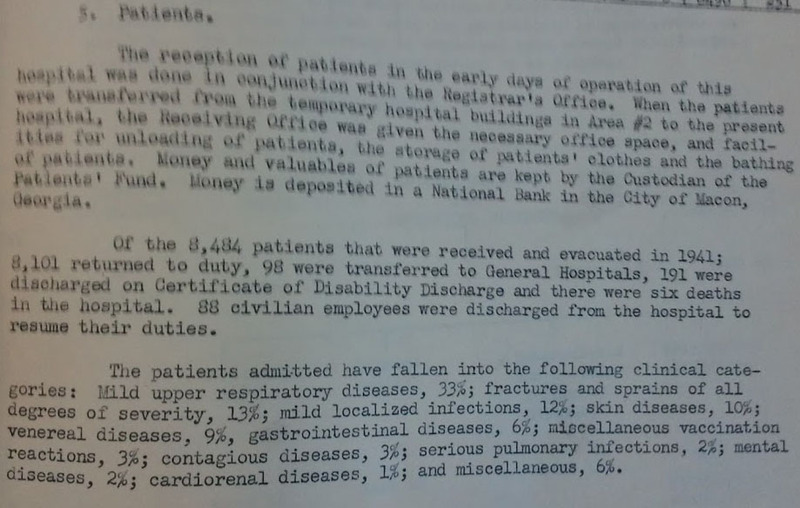 There are impressive amounts of documentation and correspondence resulting from the station hospital records, and the best place to begin your search is with the Records of the Office of the Surgeon General (RG112). Of course your pre-work, as explained below in the Case Study Brief, should have been completed, prior to taking on this NARA task. The Surgeon General Annual report will not name your ancestor by name, but provides an overview of the hospital patients: number of disability discharges, mental issue occurrences, venereal disease issue, camp hospital outbreaks, etc. It is in the correspondence that you will find your ancestor’s name. Be sure to understand the process. 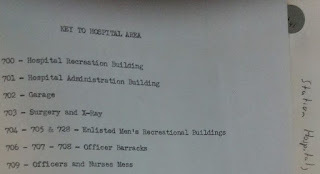 The hospital reports are forwarded to both the Veterans Service File (hopefully salvaged and safely archived in your ancestor’s file at the National Personnel Record Center, St. Louis) and a copy was traditionally sent to the Adjutant General’s Office (AGO). The AGO may maintain these records, but usually they were forwarded and are stored at the NARA in College Park (for Modern Military). However, you may also wish to check State Archives, and regional Archives. The Adjutant General keeps the Surgeon General’s Office (SGO) abreast, and often has to notify the SGO for both disciplinary actions (in case of injuries caused by neglect which includes venereal disease) and for discharge due to medical reasons. 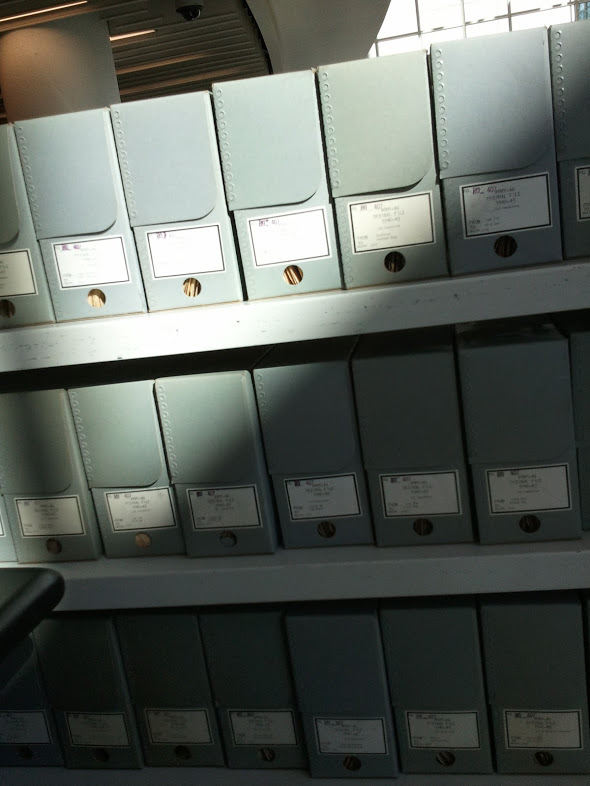 The correspondence can most often be located in the AGO Decimal Correspondence of RG 407.2.1 Be sure not to disregard the Decimal Files of the Records of the Adjutant General’s Office, 1917 - even though there are over 5, 018 rolls of microfilm from 1948-1962 in the Decimal Correspondence (RG 407.2.1) alone. It is in this chain of correspondence letters, notes, telegrams, that you may find your ancestor discussed. Know the common flu, unless resulted in death or discharge, did not warrant descriptive explanations to the AGO or SGO. However, you can find out if there was a flu outbreak using the SGO Annual Report. Where Are Surgeon General Records Located? As to not be confusing, please note that the Records of the Office of the Surgeon General (RG112) are not just held at the NARA in College Park, but also at the Regional Offices: Atlanta, Ft. Worth Texas, Waltham, MA etc. A recent case of a burnt fire only held a veteran’s Certificate of Disability Discharge. It was clearly noted that the veteran was discharged on Section II - physical disability. The veteran only served for 2 months and was discharged. Why? This document presented us with more questions than answers beginning with for what “physical reason” was he discharged? Prior to fishing through the massive NARA Surgeon General and Adjutant General’s Correspondence, be sure to closely review anything in the veteran’s service file, (i.e. last pay voucher, discharge papers). Then it’s time to scour Morning Reports for the troops and years of your veteran. These vital troop reports can narrow the dates of your ancestor’s injury, activities and locations. If your ancestor was removed to the station hospital, he is usually named at the time of hospital entrance and return to duty. However, rarely is it explained why he was sent to the station hospital. For this reason the related correspondence is needed. If you are confused by the documents that state your American born female ancestor was not a US citizen, you are not alone. Tracing one family, the woman was a citizen as a child, had her passport application denied because she wasn't a citizen, then later applied for citizenship. Shaking my head to the confusion, once again I researched the laws of the time for answers to discover the moving citizenship requirements that were imposed after the Naturalization Act of 1906. Interestingly enough the Naturalization Act was created to standardize the naturalization procedure and citizenship requirements. Yet from 1907 to WWII, citizenship laws impacted American born women, leaving the men unscathed. Did your female ancestor marry a foreign national? The Expatriation Act of 1907 declared that an American woman who married a foreign national or alien lost her US citizenship. So from 1907 -1922 women born in the USA lost their citizenship when they married foreigners, but could only be repatriated when their husbands became naturalized citizens. Did you female ancestor marry an Asian? 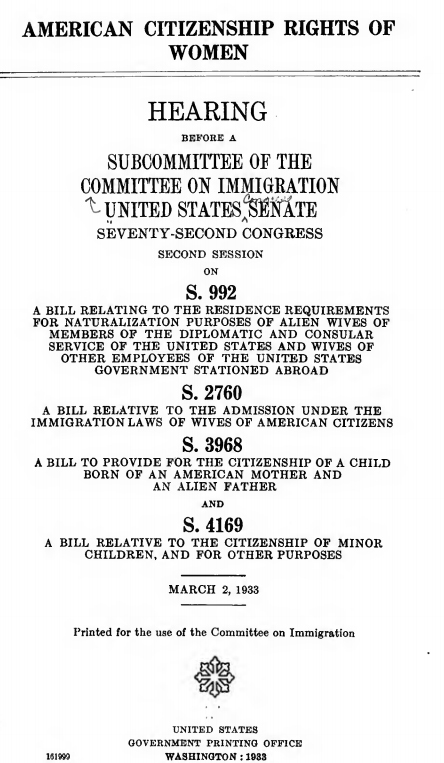 The Married Women’s Citizenship Act of 1922, also called the Cable Act, reversed most of the Expatriation Act, except in the cases of an American woman being married to an Asian. From 1922 - 1936 the Cable Act still stripped American citizenship to those married to Asian aliens. The law became more woman friendly by 1940. At this time women were allowed to repatriate if they lost their citizenship between 1907 – 1922 due to their alien spouse. However, to restore her US citizenship, the American-born was required to apply for citizenship and take the oath of allegiance. What About Men who Married Foreign Nationals? Surely you didn’t expect the same loss of citizenship to be reported for men during this timeframe? Neither the Expatriation Act of 1907 nor the Cable Act applied to men. However, the flow of immigrants was controlled by the Immigration Act of 1924 which limited European immigration and banned Asian immigration to the United States. (Note the exceptions below). During WWII the Immigration Act had to be repealed when approximately one million American soldiers married foreign women from 50 different countries. Visit the War Brides in Citizenship and the Law. 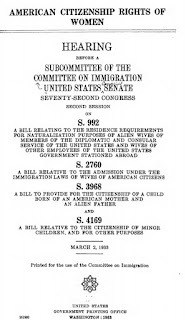 1906 The Naturalization Act of 1906 standardizes naturalization procedures, makes some knowledge of the English language a requirement for citizenship, and establishes the Bureau of Immigration and Naturalization in the Commerce Department to oversee national immigration policy. 1907 The Expatriation Act declares that an American woman who marries a foreign national loses her citizenship. Under an informal "Gentlemen's Agreement," the United States agrees not to restrict Japanese immigration in exchange for Japan's promise to voluntarily restrict Japanese emigration to the United States by not issuing passports to Japanese laborers. In return, the US promise to crack down on discrimination against Japanese-Americans, most of whom live in California. 1917 Congress immigration from Asia, except for Japan and the Philippines. The Immigration Act of 1917 restricts immigration from Asia by creating an "Asiatic Barred Zone." 1924 The Oriental Exclusion Act prohibits most immigration from Asia, including foreign-born wives and the children of American citizens of Chinese ancestry. 1934 The Tydings-McDuffe Act grants the Philippines independence from the United States on July 4, 1946, but strips Filipinos of US citizenship and severely restricts Filipino immigration to the United States.